DryStoneGarden » Blog Archive » Meep! Meep! 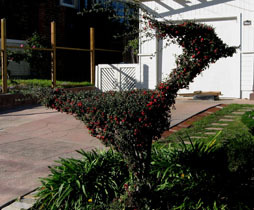 The best topiary in our neighborhood. Goofy, brilliant, makes me smile. This entry was posted on Saturday, December 20th, 2008 at 12:04 pm and is filed under richmond, california. You can follow any responses to this entry through the RSS 2.0 feed. You can leave a response, or trackback from your own site. Ha! That made me laugh. And are those agapanthas under the roadrunner?